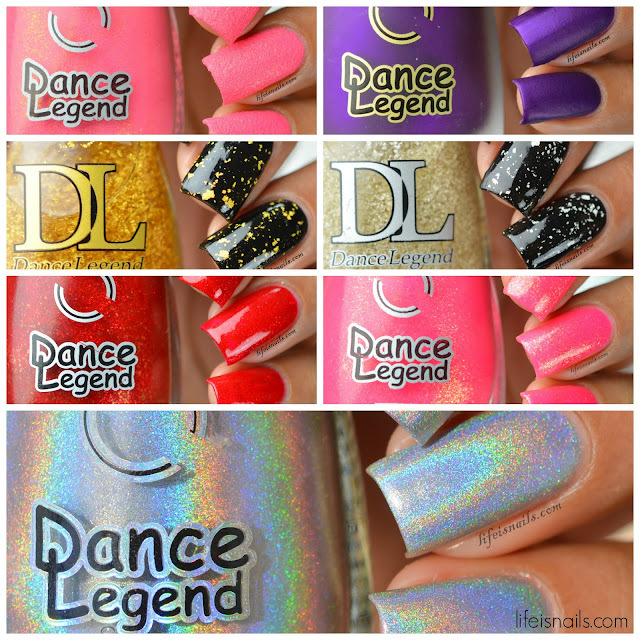 Today I have got some Dance Legend stunning polish swatches to share with you! Dance Legend have been in my favorite brand list the day I swatched the first polish from them. And they will continue to be one of my favorites. The 7 polishes I am about to show you today are from different different collections and have different finishes as well. The formula in most of the polishes was amazing, which made the application super smooth and easy except for one shade which I will discuss below. Lets hop onto the swatches shall we?! Dance Legend Luxy Glam - Its a gorgeous rosey pink with gold micro glitters in it. It is from the Sahara Crystal Collection. It dries fully textured within 15 minutes. The formula in this specific one was a bit on the thick side whiuch did gave me problems in application.Shown here is 2 coats. Dance Legend 547 - Its a stunning hot pink sheer base with gold shimmer. It is from the Confetti Collection. It looked really bright and opaque in the bottle but in actuallity it was very sheer but still the formula was nice to work with.Shown here is 3 coats with Top coat. Dance Legend Gold Leaf - Its a gorgeous gold foil leaf top coat. The formula in this was good but the gold leaves were sparse which needed me to dab onto some places of my nail to get this look which resulted into some bubbles. Shown here is 1 coat over Joshik Nubian Queen topped with Top coat. Dance Legend Silver Leaf - Its a lovely silver foil leaf top coat. The formula in this was nice and wasnt very sparse. Shown here is 1 coat over Joshik Nubian Queen topped with Top coat. Dance Legend T-1000 - Its a stunning silver linear holographic polish. It is from the New prism Collection. The formula was amazing and worked really well once applied onto the nail. Its holo is amazingly great. Shown here is 2 coats with Top coat. Dance Legend 649 - Its a beautiful purple matte polish. It is from the Matte Collection. The formula was amazing and worked really well once applied onto the nail. The matte finish comes very quickly if not instantly. Shown here is 2 coats with Top coat. Dance Legend 546 - Its a spectacular blood red jelly base with red flakies in it. It is from the Confetti Collection. Its my favorite in this set of colors because I love how beautoful red looks on my nails.Shown here is 2 coats with Top coat. Overall this entire set made me happy, I was super impressed with the quality of polishes, thier formula. These are totallly worth every penny you spend on them.